TEMECULA, CA—April 16, 2012—ProSites, the innovative medical website design firm, has released a new website solution specifically tailored to the needs of optometrists. 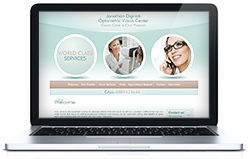 The new development helps optometrists establish a professional online presence through high-quality website designs from the industry leader, ProSites. ProSites optometry websites contain hundreds of pages of customizable, patient-focused content on vision care procedures and include unique page options such as the Ocular Health Analysis survey. This new lead generation tool is an engaging patient survey available for optometry websites and enables doctors to prepare tailored recommendations for a prospective patient prior to their first appointment, creating tremendous opportunities for doctors to generate new business for their practice. "We are excited to offer premium services that make it easy and affordable for optometrists to effectively market their practice on the Internet," remarked Lance McCollough, founder and CEO of ProSites. "Over the years, we have helped thousands of doctors grow their practice through our proven online marketing solutions, and we are confident optometrists will find the greatest value and results with our services." Founded in 2003, ProSites holds nearly a decade of experience designing state-of-the-art websites for dental professionals, plastic surgeons, ophthalmologists, and bariatric surgeons. Their most recent launch of optometry websites further validates the firm's reputation as the premier website design firm for medical and dental professionals. Because of the firm's exclusive technology, ProSites members access unmatched benefits that are absent among competitors. The company's groundbreaking content management system (CMS) allows doctors to fully control their website and make virtually any modifications instantly, with a simple "point and click." ProSites additionally holds the ability to create new enhancements as free upgrades for all of their members, and therefore ensures that doctors will always have an up-to-date website while eliminating the risk of incurring hidden fees. With ProSites, doctors are able to connect with prospects and patients through various powerful marketing mediums on the Internet. Advanced search engine optimization (SEO), mobile websites, social media techniques, and local search marketing packages are some of many additional services offered by ProSites, making it easy for doctors to attract new patients on the Internet.